However, the near future promises to bring new products which, will enrich our armamentarium and facilitate a natural, safe approach to various sinonasal disorders. The most interesting of these are those that contain plant extracts which have a local effect on the mucous membranes in the nose and paranasal sinuses. According to the experts, such products may provide rapid, safe symptom relief. Shortly after application, the patient may have a sensation of mild or moderate smarting and irritation of the nose and heavy sneezing bouts. Meanwhile, the product causes an intense reflex secretion that begins a few minutes after application and which may continue for a couple of hours. Through the intense secretion, the mucosa is dehydrated virtually instantly, causing diminished tissue oedema, decrease in mucosal inflammation and opening of the ostiomeatal complex. 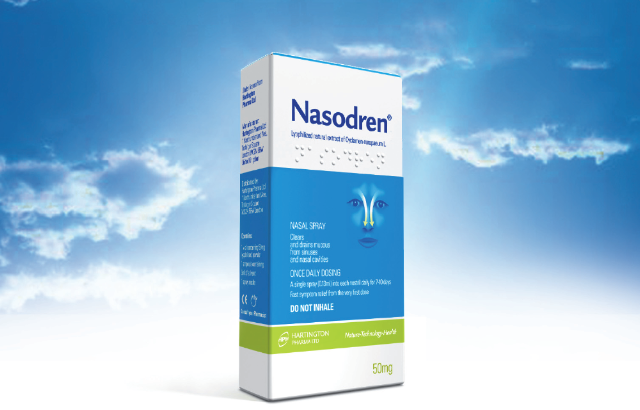 The secretion is associated with an intense physiological drainage of the nasal passages and paranasal sinuses, which is very effective in providing symptom relief. , referring to his own personal experience with this product, “expulsion of the mucus secretion into the sinuses and nasal passages and its subsequent drainage could be compared in a way with inserting a sponge inside the nose, causing a marked drying effect.” This effect, as he pointed out, “is caused by activation of the mucociliary clearing processes during administration of the cyclamen extract. Thus, one case was shown with clear signs of hyperaemia and congestion and purulent mucus in the middle meatus. Just 3 minutes after first administration of the cyclamen extract, mucus started to be expelled in large quantities from the nasal cavity and the sinuses through the ostiomeatal complex. By 5-10 minutes after administration, drainage of the mucopurulent secretions from the sinuses to the nasal passages began (for subsequent expulsion and removal). After 1 hour, the secretions became more abundant. If the patient starts to sneeze, this causes expulsion of large quantities of mucopurulent secretions. After three hours, the secretion’s nature starts to change, taking on a much more seromucous form. After three days, there are mucupurulent secretions in the middle meatus. By the third day, mucus and pus are drained from the ostiomeatal complex just 5 minutes after applying the product. Finally, after 5 days, recovery is almost complete. In short, as the speaker concluded, “spraying with these plant extracts has an effect that, above all else, consists of intensifying physiological nasal mechanisms. As a general rule and as his main observation, the expert pointed out that “all patients were symptom-free by the end of the treatment period and no rescue systemic or local therapy was required in any case. The symptom results obtained with this product in postoperative care or cleansing are also satisfactory. An improvement is observed in symptoms after the sixth day in the patients treated with the product. The treatment was started in all cases on the third day after surgery (after removing the merocel). This side effect is variable and may even be absent in postoperative patients. Sneezing, watery rhinorrhoea or isolated pain may also appear in obstructive conditions. In any case, these are mild, passing, rarely seen but expected effects that have a negligible clinical significance. Topical steroids and the combination of both therapies are the treatments associated with the best level of evidence for the management of acute rhinosinusitis. For the treatment of chronic rhinosinusitis, topical steroids have a level of evidence IIb and a degree of recommendation A. For the treatment of nasal polyps, the treatments of choice may be oral antibiotics for 12 weeks (level III, degree C) and topical steroids (Ib, recommendation A). The plant extracts have a local effect on the mucous membranes in the nose and paranasal sinuses. According to the experts, such products may provide rapid, safe symptom relief. The secretion is associated with an intense physiological drainage of the nasal passages and paranasal sinuses, which is very effective in providing symptom relief. The plant extracts have been shown to be useful in clearing the surgical cavity, reducing the need for aggressive care, diminishing the number of postoperative dressing changes, and promoting physiological drainage.